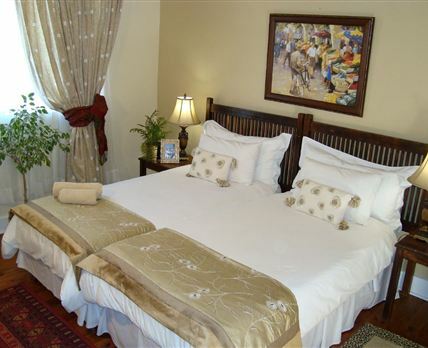 Avondrust Guesthouse – Somerset East: Housed in a delightful Victorian-style building on the corner of Rawson and Louis Trichardt Streets, Avondrust Guesthouse presents itself as an upmarket 3 Star guest house. Just one block away from Main Street, it is within walking distance of all shops, schools and restaurants. We offer seven rooms with en-suite bathrooms. All of the rooms have tea and coffee-making facilities, fridges, electric blankets and fans. Three of the rooms are air-conditioned. We also have a self-catering Garden Flat which sleeps four guests. Four of the rooms open onto a large wooden deck which overlooks the mountain. We have secure parking, DStv and a laundry service. Breakfast is served in a refurbished stable exhibiting a rustic atmosphere that is beautifully decorated. A large wooden deck at the back of the house has a magnificent view of the mountain. We have off-street parking, a braai facility, and lunch boxes and dinner can be arranged. The forested, mountainous backdrop creates a dramatic setting for the town which is within sight of no less than 16 waterfalls. This is where you will find the thickly wooded Boschberg Nature Reserve, with its popular hiking trails including a 15 km circular route to an overnight hut at the summit of the mountain. Somerset East is an excellent birdwatching destination. Other adventures include trout fishing on five local dams, as well as rainbow and brown trout fishing in the Glen Avon Waterfall pools. The 9-hole golf course is said to be one of the most beautiful in the country. Annual events include the Castle Lager Biltong Festival which is held every year around July, the Caltex Bruintjieshoogte Cycle Tour and marathon run between Pearston and Somerset East every year during March, and the Spring Rose and Flower Show is known to produce some of the finest roses in the country. Click here to enquire at Avondrust Guesthouse – Somerset East.